Find the Spring 2018 /Europe Tourdates here. 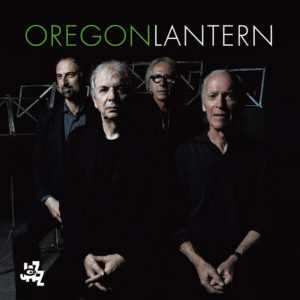 Oregon’s 30th album since its founding in 1970 is an amalgam of sounds and musical attitudes: It melds earthy tones, sinuous melodies and subtle meters into improvisatory postcards that lure our imaginations from familiar waters into uncharted depths. Cordial co-captains man the helm: Paul McCandless steadfastly plays soprano saxophone and oft-over-looked double-reeds and pipes, while Ralph Towner glides between authoritative classical guitar and piano. They assure Oregon’s chameleonic duality: pleasure craft meets research vessel. Crewmen Mark Walker (drummer since 1996) and Paolino Dalla Porta (suavely replacing founding bassist Glen Moore in 2015) fuse easy resonance with light touch to achieve airy, simpatico ensembles. Oregon’s timeless book (mainly Towner’s ever-catchy tunes) seamlessly blends jazz with world and folk traditions, resulting in a conic imprint that is identifiable yet bracing. Oregon revisits house classics with a kick: “The Glide” swerves breezily with tasty drums and a sweeping coda. Cheerful openers explore complex meters in beguiling ways: “Duende” shifts from 5/4 to 3/4 for solos. On “Dolomiti Dance,” Walker skitters between Brazilian caxixi, Egyptian darbouka and African djembe. Ballad interludes pair keen oboe and warm bass and guitar in a sweet embrace. Dalla Porta’s “Aeolian Tale” refreshes with a flamenco lilt, framed by lovely guitar variations. The Scottish folk song “The Water Is Wide” returns us near home, tempering Americana with a gentle bolero. Good ship Oregon, pushing 50 with a modest patina, shines an honest lantern on jazz.